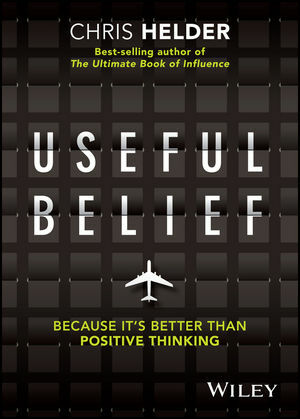 Useful Belief turns the "be positive" industry upside down with a fresh and modern approach to achievement. Sometimes things in life are not positive. Sometimes bad things happen to good people. If you've had a nightmare of a year, the last thing you want to hear is "Be positive!" Instead, you need an actual strategy to dig yourself out, and a truly useful guidebook to show you where to go next. This is that guidebook. Through the engaging tale of a business traveller and the three significant encounters on his journey, this book takes you on a journey of your own — to self awareness, and an improved approach to business, parenting and relationships. You'll learn how thinking "useful" is better than thinking "positive", and you'll uncover the utility of your past, present and future challenges. You'll undergo a major shift in the way you solve your problems, and you'll learn how to navigate your way out of ambiguity and toward success. If you have challenges at work right now, just deciding to "be positive" will not fix them. Useful belief and strategy will. This book shows you how to frame your challenges to make them surmountable, and how to formulate an action plan for getting where you need to be. Discover the truth about "truth" and the importance of "useful"
Everything that has ever happened to you has happened for a reason. It doesn't matter if it's true, because it's useful to believe it is true. Useful Belief leads you toward the self-awareness and strategic outlook you need to achieve personal fulfillment and professional success.